House Redoran is one of the five Great Houses of Morrowind. 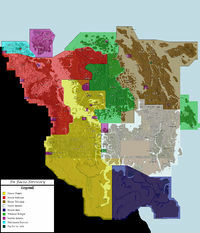 It governs the Redoran District of north western Morrowind from the city of Blacklight, close to the border with Skyrim. Redoran are not individualists, but they are locally oriented and provincial compared to the House Indoril. They tend to conceptualize the House Redoran in terms of their immediate family and community rather than the House at large. The main focus of House Redoran is maintaining the traditions of the settled Dunmer and, more specifically, the way of the warrior. Due to this focus, the Tribunal Temple is a natural ally. There is also mutual respect between them and the Fighters Guild and Imperial Legion. They have less respect for the other Imperial institutions, such as the Mages Guild, the Thieves Guild and the Imperial Cult religion. There are at this time no members of House Redoran, named or otherwise, in any released maps.